Overview & specs of Ellia Gather Ultrasonic Oil Diffuser by Currys PC World. Top features: - Natural aromas to enhance your wellness- Beautiful design for a zen-like space- Relaxing sounds to help ease stress- Remote control to set up easilyNatural aromasStay mindful of your wellbeing with the Ellia Gather Ultrasonic Oil Diffuser, which releases a fine mist of natural essential oil aromas to help you relax and take care of your body and soul. 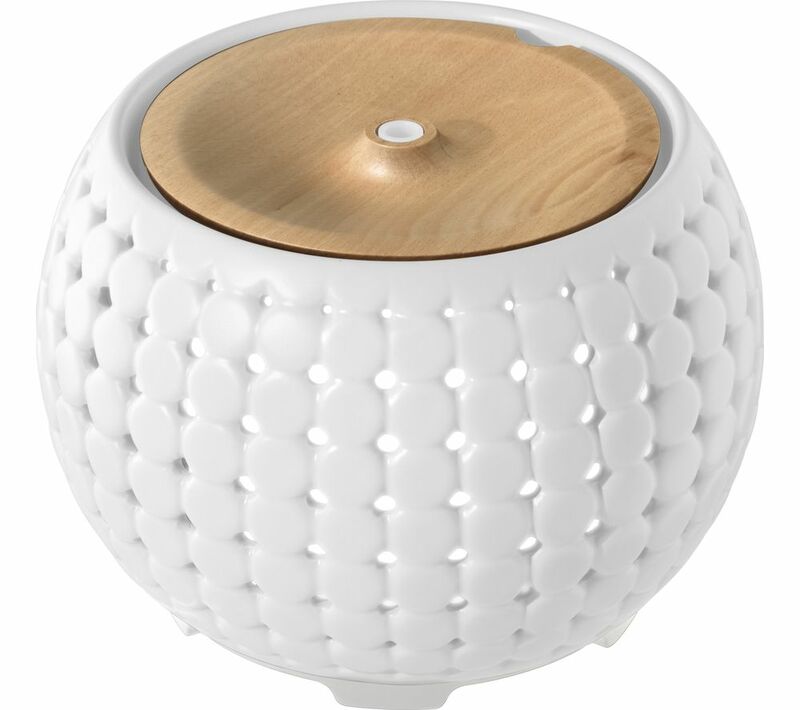 Simply fill it with water and add a few drops of your favourite essential oil to improve the air in your home.Beautiful designMade with ceramic and wood, this oil diffuser is designed to flow with your space naturally. Mood lighting helps create a gentle glow for a soothing environment. Relaxing soundsTake advantage of relaxing sounds of nature to heighten your relaxation and ease stress, particularly after a long and busy day. Remote controlSetting up your relaxation session is simple. A remote control lets you customise lighting, sounds and oil diffusion from the comfort of your sofa or elsewhere. Enjoy up to 10 hours of a soothing experience at a time.With the included Essential Oil Starter Kit, you can enjoy two essentials oils - sweet orange for an energy boost and peppermint to raise your spirits. We are comparing prices for Ellia Gather Ultrasonic Oil Diffuser in new condition sold by Currys Pc World.